Tammy keeps a lot going on over at daisy yellow art, so you should click over and check out her special style, bright colors and a happy atmosphere. My index cards are not one a day because I have general living issues which I am continually working on to be able to share a space in each day with some of my art playing. I am going to be working my way through a book that I have had for quite awhile called Creative Foundations by: Vicki Boutin. The crayon resist cards I did was one of the techniques in the book I just forgot to give her credit. These will be great techniques that I can also incorporate into my art journals. 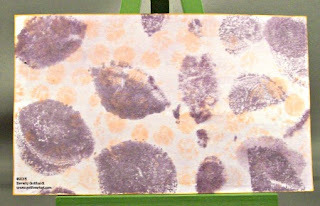 In the book Vicki suggests acrylic paint brushed on the bubble wrap and then stamping, but I wanted to try these two dye inks. After I stamped the purple I swiped across it to see if it would make striations like the acrylic paint would have, but it made more like a watercolor wash which I kind of liked. The purple was stamped with some large bubble and the peach color with some small bubbles. I you are participating in the Index Card A Day challenge I hope you're having fun. If you're not familiar with this click over and check out what's going on. There are some pretty cool takes on Tammy's Themes and Prompts.